First. Calgary Stampede July 8-17, 2011. 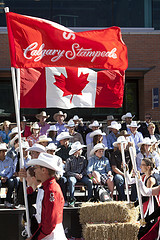 Parade took place as usual downtown Calgary.Look at the photos to the right and to the left. Do you recognize new faces on Stampede? Oh, yes, you are right. It’s roalties: Will and Kate on their honeymoon travelling across Canada. Second. The Lions Club of Calgary is building a new seniors’ facility in the city’s northwest that will provide affordable housing for 130 people. The $20-million project, called Lions Village, is expected to open as early as 2013. Third. Alberta Society of Artists at 80 Years is a two part exhibition honouring past artistic achievements as well as highlighting recent practices by 11 members of the society. The exhibition starts on July 7th with a soiree at 7.30 p.m. at the Triangle Gallery. Fourth. The Calgary Turkish Festival takes place at Eau Claire Market on July 9 and 10. There’s a Turkish saying that one cup of coffee has a memory of 40 years. Fifth. Throughout three moonless nights in July, dark skies over Alberta will allow the public to view the Milky Way in unprecedented clarity from the Rothney Astrophysical Observatory on July 27, 28, and 29, between 10 p. m. and 2 a. m. Admission is a donation to the Rothney Astrophysical Observatory educational programming. Contact Jennifer Howse at 403-931-2366.